Product prices and availability are accurate as of 2019-04-21 19:59:07 UTC and are subject to change. Any price and availability information displayed on http://www.amazon.com/ at the time of purchase will apply to the purchase of this product. 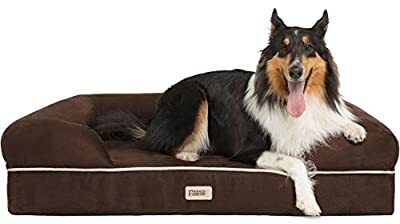 This Orthopedic Dog Bed is medically designed to provide comfort to your dog while they sleep-- even for dog's that have arthritis or joint pains! With a removable cover and a water resistant liner, this bed is easy to clean, wash and care for! Please check the sizing guide to find the perfect sized bed for your dog.